by Molly Jane Kremer, Clyde Hall, Mickey Rivera, Sara Mitchell and Jarrod Jones. Comics that challenge us, slay us, beguile us — the comics we simply can’t wait to devour. That’s DoomRocket’s Staff Picks. 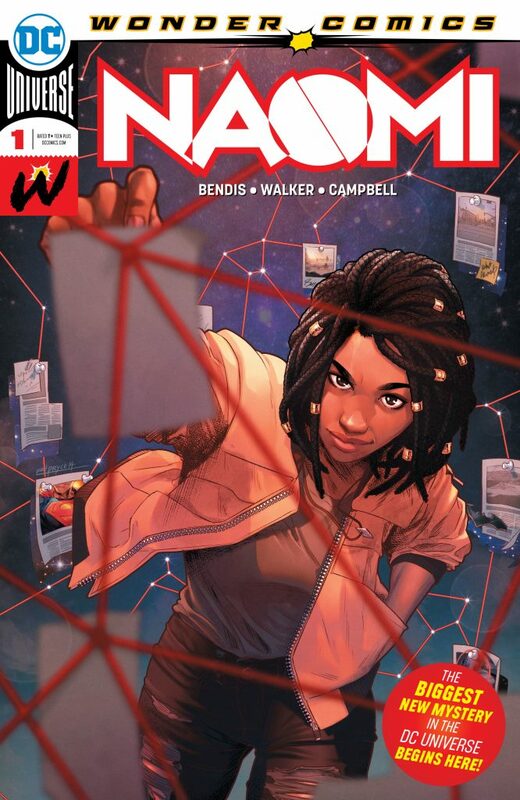 From ‘Naomi’ #1 to the kick-off of the new BOOM! 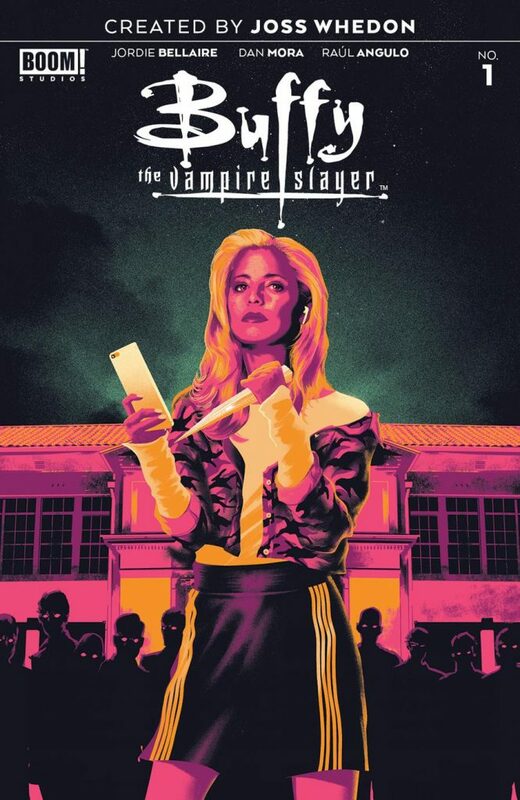 Studios era of ‘Buffy’, here are the comics that have our hearts set ablaze this week. Written by Brian Michael Bendis and David Walker. JJ: Young Justice established the energy behind Brian Michael Bendis’ DC YA imprint Wonder Comics, but Naomi wants to slow things down a bit. It’s standard Bendis stuff: Quiet the pacing, hang back and chill with all his witty, wonderful characters. I’m getting the hang of his DC rhythms. It’s the kind of methodical storytelling that demands long creative runs, those definitive kinds that hurl characters like Miles Morales and Jessica Jones into the strata of legend. Now Naomi. Last name? Currently unknown. We know that Bendis likes his alliteration (hey, me too! ), but perhaps that’s too obvious. (So long as her name doesn’t turn out to be “Neron”, I think we’ll all be okay.) All we know so far is that she’s stuck. Stuck in the provincial, small-town Oregon life, far away from the hustle and muscle(-y fisticuffs) found in happenin’ burgs such as Metropolis or Central City. Stuck with the faint aggravation of not knowing where she came from, or who her family actually is. And then, one day, Superman comes crashing into what passes for downtown, and sets Naomi on a course that will change the DCU forever. That’s all Naomi #1 had to deliver, but it goes deeper than that. Jamal Campbell astounds as the series’ artist, blending small-time living with the otherworldly enormity that seems to emanate off of these superhero sagas. (His Superman is one for the books.) Just the sort of stuff you want in a book that’s found itself suddenly thrust to the center of the greatest superhero universe in history. As for Bendis? He teams with David Walker, fellow Oregonian, masterful storyteller, for this assured debut issue that has me hankering for more. There’s a mystery afoot in this quiet hamlet, and it’s being told with the warmth and heart to which all cape comics should aspire. Especially those in the DCU. MJ: Buffy’s no stranger to comic books. She’s slayed her way through one series after the other for over twenty years now—in fact, this high school-aged character’s been in publication longer than she’s been alive, if you want to get canonical about it. Almost all of that time was spent under the umbrella of Dark Horse Comics, but a relaunched Buffy series has taken flight this week, and it’s all-new, all-BOOM. Dan Mora is a perfect fit for this book. He has a knack for rendering flawless likenesses of living, breathing performers while avoiding that sticky “tracing-from-stills” look, a problem more than a few comics licensed from live-action properties have fallen prey to. Through Mora, these teenagers ring true, albeit primed with a few impeccable, and probably pricey, fashion choices. But it all serves to reinforce their newfound youth. This is the shot in the arm the franchise needed, delivered with the power of an expertly-placed stake through the heart. 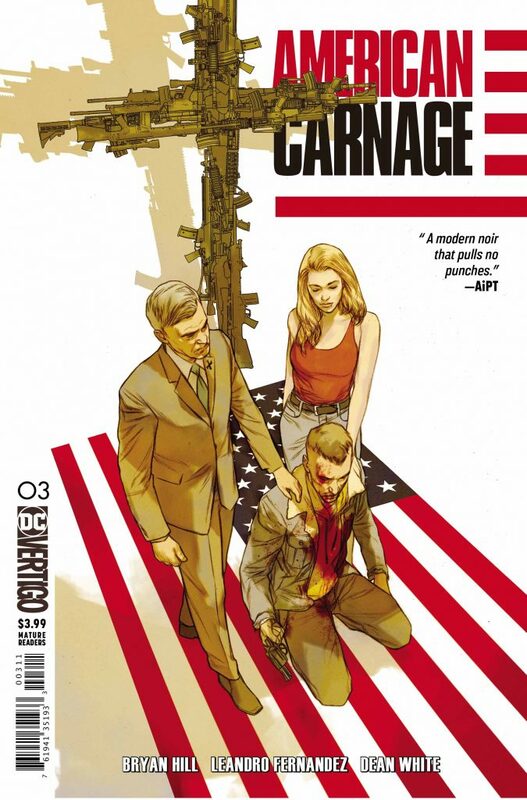 SM: It takes a shocking boldness for Bryan Hill and DC Vertigo to serve up a dish of violent white supremacy in America and call it American Carnage, since the term itself was made popular by Donald Trump in his now infamous inauguration speech. Unflinching storytelling is exactly what you can expect with this series. American Carnage continues to unfold before us, telling a story of the vicious world in which a biracial detective weaponizes his appearance as a white man in order to infiltrate and bring justice down upon a growing racist organization. Despite the stunning imagery found on Ben Oliver’s covers for American Carnage, the interiors by Leandro Fernandez are much more simplistic. It feels like naturalistic film. No filter, no “magic.” There’s no gloss to remind you that this is fiction. It’s pure photography; it’s real. And real is absolutely dangerous. There’s no quirky aesthetic to soften the blow of the cold, cruel world, and there’s no saving you from the troublesome game of trying to exist amongst other people. As far as dialogue goes, however—it’s something you can have fun leaning into and embracing, as it’s a very unnatural approach. While it does feel like the characters at any moment could peer out over their sunglasses and look directly into the reader’s eyes as the CSI: Miami theme begins to play, I’ve got to give Hill credit for the balls it takes to tell a story such as this and bring it to the table without mincing words. American Carnage is direct about its subject matter. Just as the art is a photograph, so too is the story. You’re not getting a filtered account of the action, you are bearing witness to the actuality. Written by Jody Houser and Andrew R. Robinson. CH: Jody Houser is a name to know. She’s written Mother Panic for DC’s Young Animal, and Star Wars: Thrawn at Marvel, and lots of other cool stuff. But I know her mostly for the mentioned two titles, and one of my New Year’s Resolutions is to read more Houser. Maybe even all Houser. She’s good. I’m no gamer, not the non-RPG type anyway. Seeing the promos and screencaps of Marvel’s Spider-Man for the PS4 is vicarious fun, but manageable carpal tunnel syndrome and time constraints prevent me from falling back into the gaming habits of youth. Comic books based on video games don’t normally top my list to read; what lovely details will I miss, never having played? 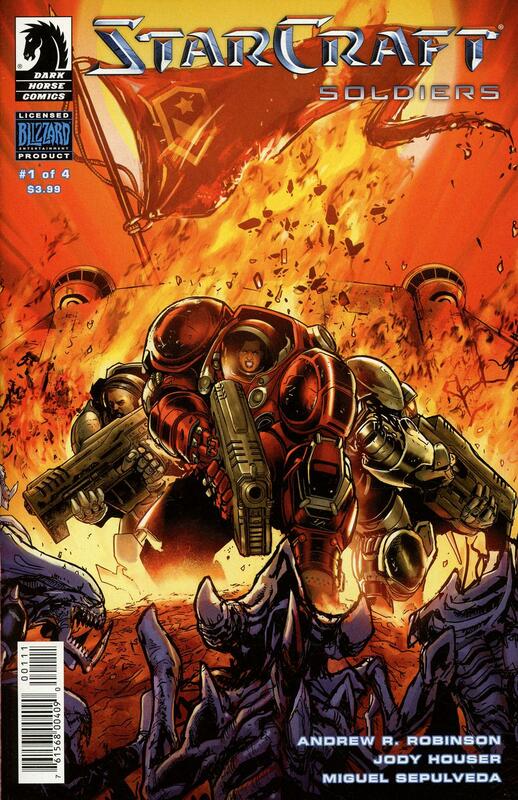 Then came solicits on StarCraft: Soldiers written by Jody Houser and Andrew R. Robinson, from Dark Horse Comics. Houser wrote a previous title there, StarCraft: Scavengers. Piqued, I glommed onto those and read the 4-issue run, determined that the Houser Resolution would not go the way of past resolves. Read the whole set in one sitting. I have no shame. But in my defense: Jody Houser. Scavengers gave me everything I needed to invest in the story. I’m not sure how much actual game background was folded in, but it didn’t matter. I was a satisfying, perch-on-the-chair-edge read. I’m not as familiar with Andrew R. Robinson, but Miguel Sepulveda on art added to the sell. Add in elements like having a Dominion protagonist, the Zerg threat in battlefield confrontations, and a young warrior untested by interstellar conflict getting her first tour on the line. Especially when she could have settled for a cushy, promotional fast-track posting instead. It’s a very different story than Scavengers. I’m ready to explore more World of StarCraft. MR: A hypnotized calm washes over me when I’m reading a comic that has writing perfectly matched to art. Cover is giving me this vibe. Brian Michael Bendis and David Mack, both already the cream of the crop, are totally in harmony here. The lettering and digital coloring by Mangual and Orzu respectively polishes it all off superbly. I don’t even usually like spy fiction, but this one’s got me. 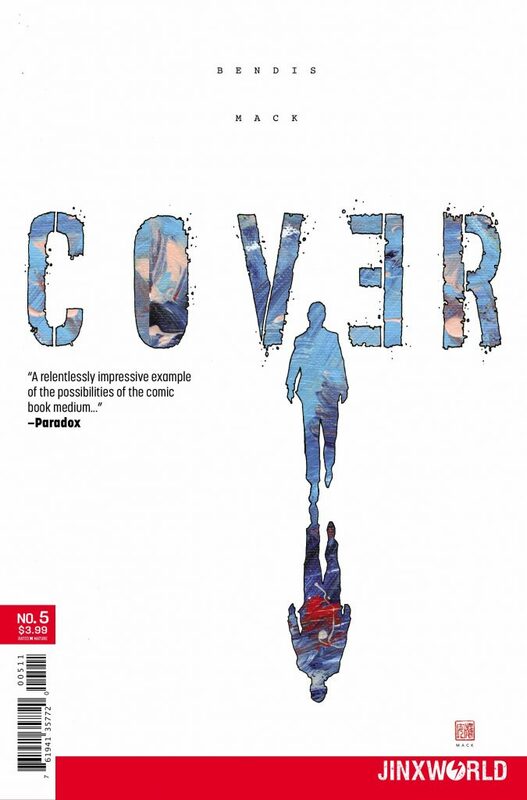 Mack’s work for Cover is chimerical, reconfiguring itself completely to suit the needs of the story. Each style he uses is done with this balanced, natural deftness that’s really hard for me to get over. I nearly faint any time he fills a page with those vibrantly, softly exploding watercolors. Cover has also, in the past couple issues, brought in guest artists like Bill Sienkiewicz and Michael Avon Oeming to draw works by some of the fictional comic professionals in the book. Bendis has used Cover to opine and wax philosophical about aspects of fandom and the comic industry, always at moments when characters are revealing something sincere about themselves. You can see him, the real Bendis, in the writing, which makes this feel like a really honest book. Besides blowing me away with the artwork, Cover has deeply engaging and hilarious dialogue. I’ll definitely be following this one for a while.